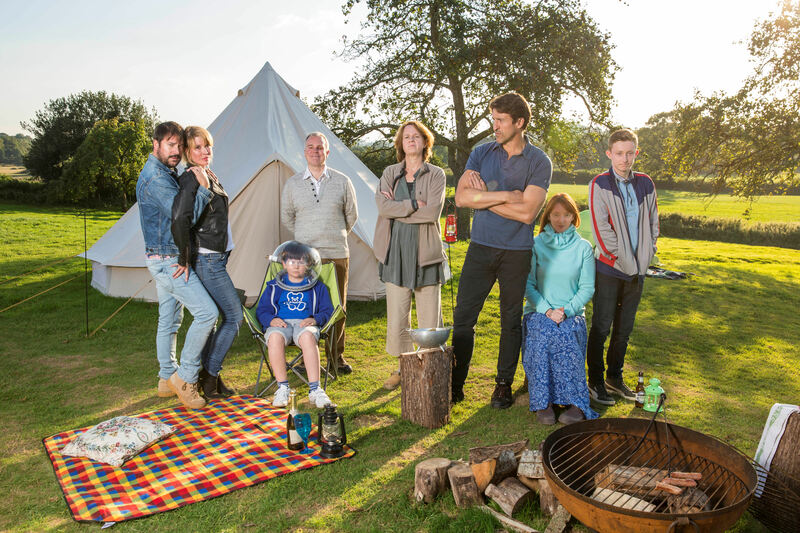 This week sees the launch of Camping – the long awaited new project from Julia Davis feauring Rufus Jones and Steve Pemberton. The six part series – written and directed by Davis – tells of a camping trip for three couples, which is less toasting marshmallows and more simmering resentments and, of course, bust-ups. Intended as a 50th birthday celebration for Robin (Pemberton), his controlling wife Fiona (Vicki Pepperdine, Getting On, Psychoville) has planned the trip to the last detail. But the spotlight is well and truly grabbed by recently separated Tom (Jones) and his new girlfriend Fay (Davis), crashing the party and encouraging deranged debauchery. Also featuring Jonathan Cake (Doll & Em), as well as Psychoville veterans Elizabeth Berrington and David Bamber, the result is a true delight: fusing Davis’ penchant for wicked dialogue and dark depravity with an impeccable cast that give their all throughout. Beyond her own Little Cracker, this is Davis’ directorial debut, and she can be immensely proud of the results. You can see it for yourself on Tuesday 12th April, with a double bill opener starting at 10pm over on Sky Atlantic. If you’re a ‘binger’ however, preferring to watch a whole series in one fell swoop, you’re in luck: it will all be available via Sky Go and Now TV on the same day, presumably until further notice. You can see a selection of photos from the series below. Let us know what you think!